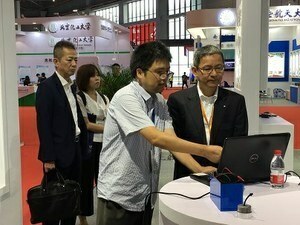 Osaka City University (OCU) participated in the 20th China International Industry Fair (universities fare and exhibitions) which took place in Shanghai from Wednesday 19 to Sunday 23 September 2018. 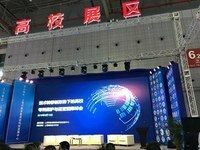 China International Industry Fair, the most influential international industrial fair in China, has been held every year since 1999. Celebrating its 20th anniversary this year, it was held at the National Exhibition and Convention Center, the world biggest exhibition hall in Shanghai, as last year. 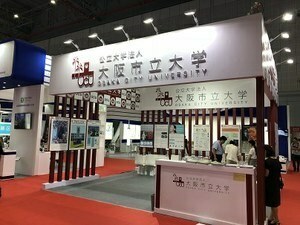 Cities of Osaka and Shanghai have had students and researchers exchanges for many years and every year OCU has been invited to the fair by Shanghai Municipal Education Committee and exhibited a booth since 2010. OCU is the only participating university from Japan. 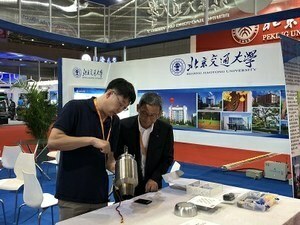 On the exhibition day the OCU booth was visited by the Shanghai Municipal Education Committee and the exhibition of research achievement was introduced. Round table discussion on application of intellectual property, by five representative universities including the invited ones, took place this year. As a speaker, Vice President Hashimoto introduced about application of intellectual property at OCU. 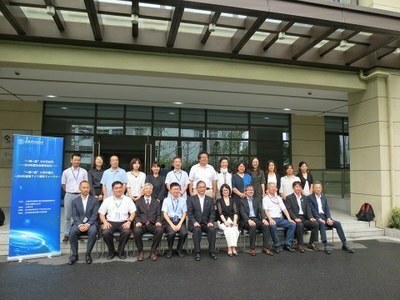 Next day he visited exhibitions of the other universities, mainly the ones having exchanges with OCU, such as East China Normal University and Beijing Jiaotong University. 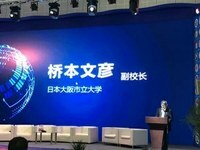 After participation in the China International Industry Fair, Vice President Hashimoto held a Global Exchange Advisers Conference in Shanghai on Wednesday 19 September. 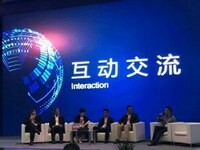 Global exchange advisers are the collaborators for OCU overseas activities and amongst the ones in charge of Shanghai, three global exchange advisers attended this conference. Plans for future activities in Shanghai were advised and how to appeal OCU in China for acquiring international students, were discussed. 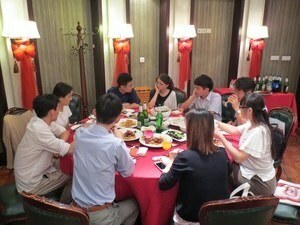 After the Global Exchange Advisers Conference, Shanghai Homecoming Day was held in Shanghai. Vice President Hashimoto reported updates on OCU as well as the consolidation with Osaka Prefecture University followed by greetings from Mr Kohei Yoshida, Chairman of Shanghai Alumni Association. After guests of honor and global exchange advisers were introduced, a reception started with a toast by Mr Yoshida. Approximately 50 people including OCU alumni, guests of honor and the university concerned, the reception was successfully over in a cozy atmosphere. 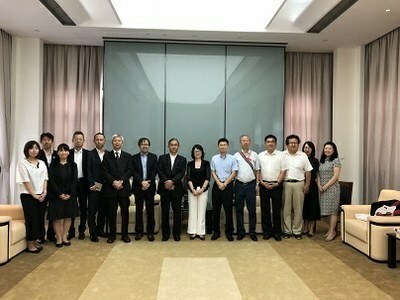 A party of those concerned with the university including Vice President Hashimoto, visited Shanghai University of International Business and Economics (SUIBE) Gubei Campus located in Changing District on Thursday 20 September. 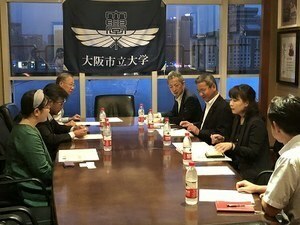 The party had a talk with Vice President Jie Chen and those concerned with SUIBE. They confirmed continued promotion of academic exchanges. 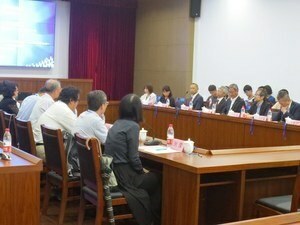 After visiting Mr Chen and those concerned with SUIBE, the 5th East Asia City Dialogue Forum was held in the SUIBE Gubei Campus. This forum, took place for the first time at Shanghai University in November 2013, is held every year reciprocally in both cities. 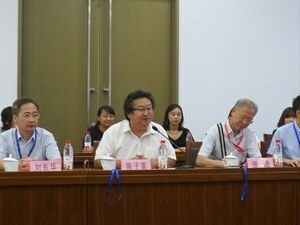 Mr Zilei Chen, Director and Professor, SUIBE, facilitated the whole forum this time. 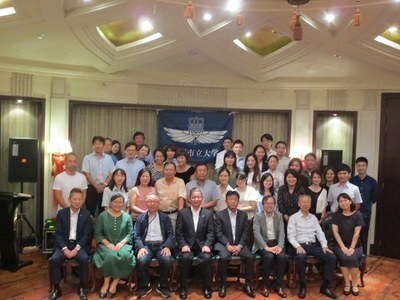 It began with messages from SUIBE Vice President Jie Chen, Shanghai Foreign Friendship Association of Japan Office Director Haijun Cao, and OCU Vice President/Global Exchange Office Director Akihiro Odanaka, which were followed by commemorative photo. Intense opinions were exchanged after the presentations and the forum was over with the closing address by Mr Jin Zhang, former distinguished consultant from International Education Association Shanghai. As presentations at this forum were all in Japanese, not only those concerned with both universities but also students studying Japanese at SUIBE and Shanghai University came to observe. 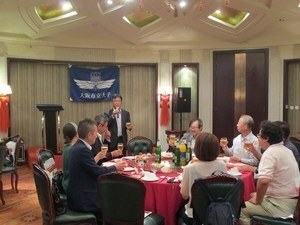 Global Exchange Office will continue various activities in Shanghai in cooperation with Shanghai Friendship Association (Alumni Association) and related agencies in Shanghai.